Very sad news. My wife and I visited Paris last September for our 40th anniversary. One evening as we walked along the Seine we stopped and watched an elderly gentleman paint with watercolors. We chatted with him for about 15-20 minutes as he painted. He was a wonderful charming man. We purchased two watercolors from him, one is of Notre Dame Cathedral. We had the watercolors framed and they're great reminders of the great trip we had. 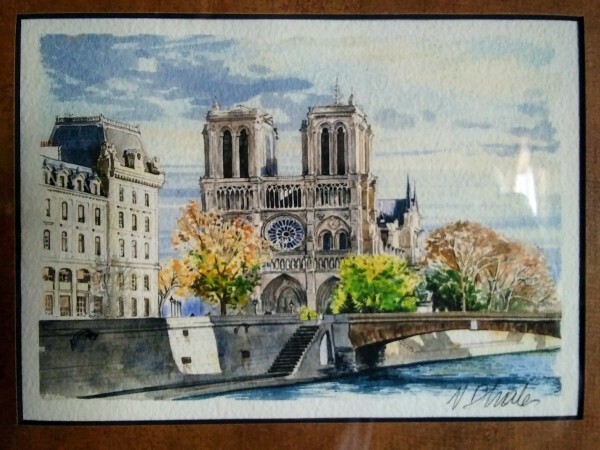 Here is the Notre Dame Cathedral watercolor. This must be gut wrenching for the French to watch. General Choltitz 75 years later can finally answer in the affirmative. This is such sad news. I never had the priveledge of seeing it firsthand and now it is doubtful that my kids will get the chance either. That said, I agree that it will be rebuilt. I was surprised to read how much of the building that existed prior to the fire had been started or updated in the last 225 years or so. This gives me hope that it will rise from the ashes again. They can rebuild the outside but never replace what was inside. I kick myself for not going inside the place when I had the opportunity. I was in Paris in 1988 with my then girlfriend Mary with who we'd just had an argument about going up the Eiffel Tower. I declined as I fear heights so said to her to go up and I would wait below but no, she didn't want that. Long story short, we wandered past and admired the Notre Dame cathedral but never went inside! "I would only add that, regardless of the cause, I see it as symbolic of and symptomatic of the general deterioration of western civilization." Would you care to elaborate on that please? BBC reports they saved the towers and the art. The spire and 2/3 of the roof are gone. Good news. It'll be back sooner rather than later, then. Of course, it will never be exactly the same, but changes have been made over the centuries, and in 50 years, no one will be lamenting what was lost. Your children can visit with equanimity! Sickening to see. Later this evening, officials said the underlying structure was saved, but the spire, much art, and stain glass windows are gone. I'm glad I saw it about ten years ago and went inside. There are other cathedrals in Paris, but until the Notre-Dame is restored, perhaps the one to see is in Chartre, about thirty minutes away. I would only add that, regardless of the cause, I see it as symbolic of and symptomatic of the general deterioration of western civilization. brian: I also would love a paragraph or two as to how you arrived at that thought. I promise not to respond, no matter what you write. But, I am immensely curious as to the "how." I remember visiting Notre Dame when I backpacked across Western Europe in 1972. It was truly awe inspiring, It will be rebuilt. It has survived fires before. The possible loss of the rose windows is a terrible tragedy, but they have been rebuilt before ad will be rebuilt again. I’m glad there was no loss of life. Now, please let the culprit not be a smoker. Please. We’re demonized enough. I'd be happy to, but have had no time yet (hard to believe, I know...but I have actually had some other things to do). But I will as soon as I am able. LOL … please feel free to respond Warren when I get around to it. And not to worry...I fully expect your view to be quite the opposite of mine. If it were to turn out otherwise, it'll just be another one of those dates to mark on the calendar. The culprit was more than likely a blowtorch. The reports I'm reading state that the fire is being labeled an accident, brought about by the restoration work being done on the building. Ok, well, regarding the issue of the West being in decline, I could make a laundry list of all of the reasons why I believe that is true...in steep, advanced decline in so many ways...and I even started to, but decided not to for two reasons. One, this has been a tiring Monday and I'm just not sufficiently motivated to do it right now. Two, so much has been said and written on this subject over the last decade or so that it's kind of pointless for me to regurgitate it. If anyone is not already of that opinion, nothing I say is going to make any difference to them. As for Notre Dame burning being symbolic of that, I don't really understand why that would need explaining. A structure that impressive...of that exquisite beauty and architectue burning...is to me symbolic of the deterioration of the west. Is that really difficult to understand...particularly in light of the course of events in Western Europe in recent years...and particularly in France. Now to really elaborate on that would require a conversation that can't be had here. The last part regarding it being "symptomatic" of the deterioration of the west, well that can't be substantiated in any way of course, but it just strikes me that way (or at least potentially)...even if it was accidental. The most extreme precautions should have been in place to prevent such an accident from even being possible at such a place. It strikes me as a reflection of a kind of carelessness that stems from our general decline. Now yes, I know...all of that is just crazy nonsense of course...but it was requested. Sad news Indeed, but it will be restored. The last part regarding it being "symptomatic" of the deterioration of the west, well that can't be substantiated in any way of course, but it just strikes me that way (or at least potentially). Just because it was being converted to condos, you get all serious. It seems that it can be rebuilt. The roof is quite a loss with the gothic vaults, but what can you do? Preliminary reports seem to indicate an accident ... at least nobody was crazy enough to deliberately set it on fire. "The most extreme precautions should have been in place to prevent such an accident from even being possible at such a place." Brian64, that one sentence is the only one you wrote that made any sense to me. Some good news this morning, the giant rose window and most of the structure is intact. I read that last night somewhere that it survived. No sources to cite though. Whether or not the church can afford to restore it is beside the point no? The cultural and historical significance of Notre Dame is just as significant as its religious purpose. I wonder if Forum member Tim aka 'Ashdigger' might chime in on what procedures will take place to try to determine the exact cause of the conflagration. I find it fascinating how these cases are forensically analysed to come up with the conclusions that they do. Saw photos/videos of that window. It will all be restored, so that only a few will be aware of what was lost forever. Jay, based on the limited coverage I've see, I know there is a ton of it available, I'd start with the earliest video footage available. I'd interview the crew(s) working that day and just prior to the incident. This will be a massive undertaking, but who has that much insurance? This is a tragedy, most likely an avoidable one. It is hardly Notre-Dame, but a local historical courthouse in a nearby county caught fire during renovation and burnt to a shell and was later carefully restored to full use. At the time, I interpreted the fire as caused by use of a torch or power tools in the construction area with lots of sawdust on the floor and in the air. 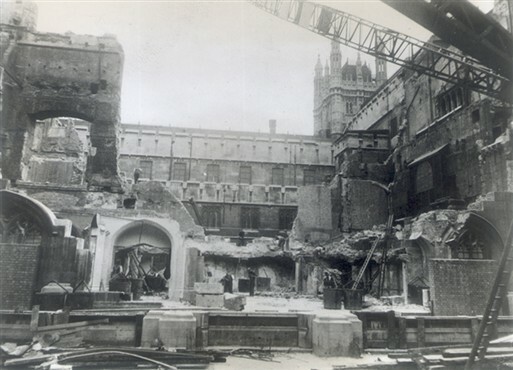 Of course, the Notre-Dame fire will be carefully studied in terms of cause, but I think many construction workers used to working on more modern buildings don't always think about the extra hazards of older, drier, more flammable reconstruction. The Notre-Dame spire was mostly oak and had been drying out since it was built in the Nineteenth Century, reports said. Much of the rest of the building dates back more like 850 years. "Jay, based on the limited coverage I've seen, I know there is a ton of it available, I'd start with the earliest video footage available. Thanks Tim. I should imagine amongst many tons of rubble, half burned timbers and thousands of gallons of water the investigators will have no easy task in determining the causal factor. As for speaking to work crews, who is going to put his hands up and say "I left my blowtorch running while I went for a pee"? That's not as complicated as it seems. The tricky part is recovering the torch or it's components to use as evidence and proff. Because of the nature of the structure, its historical significance, and the importance this site holds to many all over the world, I wouldn't be surprised to see that money will not be an issue, if that's what I gather you're trying to say Tim. Tim is being, he's a professional after all, purposely vague I suspect. Fires leave patterns. Some obvious and some, very subtle. The area where the fire started should be (Note, should be) easy to pin down. Guessing that some of the best investigators in Europe will be employed in tracking down the cause(s) should (There's that word again.) it be found. But, a number of possible causes may be found or, posited. My belief is, arson is being intentionally downplayed because the subject itself could cause more problems, civil unrest. I know the fire investigators haven't ruled such out this early in the investigation. I doubt the professionals have ruled out anything at this stage in the investigation. Only the politicians would voice such so as to dampen down any possible irresponsible responses. First responders (No word if they were fire fighters, construction people or cathedral employees when I typed this.) found no fire when they responded the first time. I find that very interesting. A later, second alarm was required. It'll be interesting, if that report is true, to know the "why" to that. So, all we can do is wait and keep speculation unvoiced. Let the pros do their job. After that? Well, most will accept the findings and the "conspiracy" folks can start writing their books and pontificating on TV. Good moneys to be made in that! "I left my blowtorch running while I went for a pee"? Jay: It happens. Guilt is a terrific motivator. Well, on the brighter side and with the thoughts leaning more towards restoration, I just read that French billionaire Francois Henri Pinault pledged $113 million toward reconstructing the cathedral and fellow billionaire Bernard Arnault and his LVMH group pledged $226 million. I'm sure there will be others. It's nice to see a lot of the art, the 18th century organ and religious artifacts were saved. Notice how Arnault "one upped" the Pinault, doubling the amount? Question not the motive, simply accept the gift with gracious thanks. I just happened to notice and the cynic in me ... well, I just noticed it. After seeing that fire at Notre-Dame burn for hours, it is astonishing what all made it through, particularly people, but also stain glass windows, art, the organ (I didn't know about that), relics and much more. A firefighting classic effort, it appears. Guessing that some of the best investigators in Europe will be employed in tracking down the cause(s) should (There's that word again.) it be found. I'm assuming, of course, that IM Pei isn't given the commission. That's not how the Church works. It's not a centralised corporation. Churches and parishes are locally financed, from alms, basically. The Vatican doesn't write out cheques or give subsidies. I just read that French billionaire Francois Henri Pinault pledged $113 million toward reconstructing the cathedral and fellow billionaire Bernard Arnault and his LVMH group pledged $226 million. This is even more troubling: anti-Church heathens ponying up to prop themselves up, but more important ominous, rushing in to rebuild the church in their own image. With Macron recently declaring that Notre Dame will be rebuilt in a manner 'more appropriate to our diverse, modern times' you wonder whether the new product will be even Christian. Wouldn't we be better off with a safe space for all persons, rather than a monument to the institutionalized oppression of the masses? With Macron recently declaring that Notre Dame will be rebuilt in a manner 'more appropriate to our diverse, modern times' you wonder whether the new product will be even Christian. Ah, there we go! I'm feeling safer already! Amen brother! What reeducation camp did you attend? I want to book a weekend there for my wives wife and I.
I want to book a weekend there for my wives wife and I.
Kamp Leon. Be sure to wear you Greek fisherman's cap and sustainable sourced, fair trade sweater-vest. "As for speaking to work crews, who is going to put his hands up and say "I left my blowtorch running while I went for a pee"?" Why am I picturing a mime with a cigarette dangling out of his mouth giving that famous Gallic shrug? Let me shoulder my way into this last car. Oops, sorry! Excuse me! I wanna see this train wreck unfold firsthand. I'm always in my safe space. I have the means to insure that is always so. Of course, it may not be all that safe for others. I made a commitment to stop making sense when I became a Talking Heads fan earlier this year. I'm glad to see I've made some progress, but not quite there yet. Damn, now it all makes sense. Come on guys, this should not be an opportunity for political or religious debate, we're talking of an amazingly historical building devoured by one person's negligence and how it should and will be rebuilt. I'm a confirmed atheist yet have visited more ecclesiastical buildings than many folks I know, simply for the gorgeousness of their building qulity. I visited and photographed such sites for no other reason than it gave me pleasure to see and to study such architecture created by folks who were likely living in mud brick hovels and living on subsistence diets. Please, out of respect, leave the politics out of it else Javan will be out with his closure tool! Macron can say whatever he wants but it will be the Vatican that will oversee the reconstruction. My opinion is that it will be restored/reconstructed to be as close to original as possible. A good time to be a stone mason! Jay, we can try, but it's impossible not to bring in religion AND politics when discussing the destruction of a RELIGIOUS edifice within a given sociopolitical context. 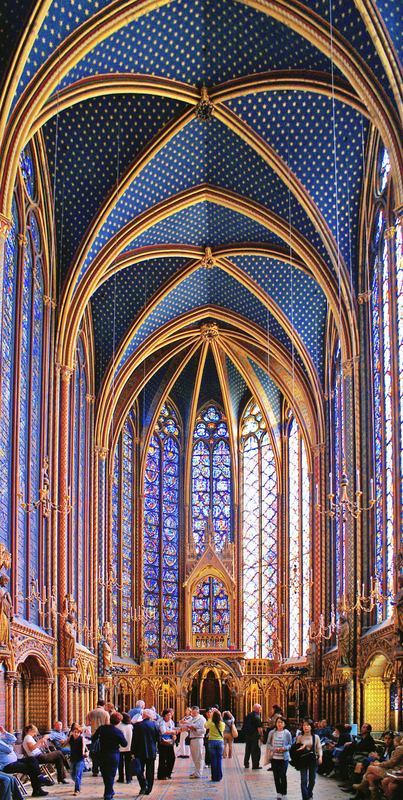 I respect your free will to not believe, and I appreciate that you're not pushing your atheism on others, but the fact remains that a number of us here are believers, even orthodox Catholics, such as yours truly; thus, we cannot under any circumstance ignore the prime purpose Notre Dame exists. Others can treat it as a museum or landmark if they want, but as, ironically, an atheist writer put it, "no amount of scepticism is going to legislate the truth out of existence". Looking at Notre Dame from a purely art appreciation perspective is akin to buying a magnificent pipe just to look at it and never loading it with tobacco and firing it up. Yes, there are many who do just this: but the vast majority of pipers will never refuse to acknowledge that a pipe's raison d'etre is the smoking of tobacco, not sitting pretty in a glass case. "Others can treat it as a museum or landmark if they want, but as, ironically, an atheist writer put it, "no amount of scepticism is going to legislate the truth out of existence"."... Ironic and hypocritical. Business as usual. Others can treat it as a museum or landmark if they want, but as, ironically, an atheist writer put it, "no amount of scepticism is going to legislate the truth out of existence". Which truth? It's a place of worship and it's also a World History site, a place of great spiritual grandeur, a witness to much history. It represents faith and power. 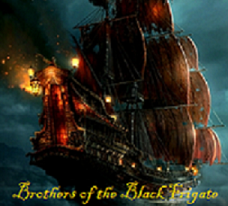 It may have been built with blood, sweat, and treachery, but the result is a place of great spiritual uplifting. I can appreciate it for what it is without denying what went into the making of it. "Guillermo Rein, professor of fire science at Imperial College London, told the BBC that "what the Paris firefighters did was close to a miracle". "It's completely different to most training because all the material burning is the roof," he said. The cathedral's roof is a complex piece of carpentry with very thin and very thick columns which are all flammable, he explained. The thin parts ignite first and then ignite thicker wood which burns for a long time. " Pairs firefighters had been specifically trained for just such an occurrence and the training paid off. Reading a bit on Notre Dame is fascinating. The Catholic Church doesn't own it, France does. At various points in time, it's been a Temple of Reason (which unsurprisingly lasted only a short period), and a warehouse. The main reason that it hasn't fallen into rubble is due to the popularity of a book about a fellow with bad posture. 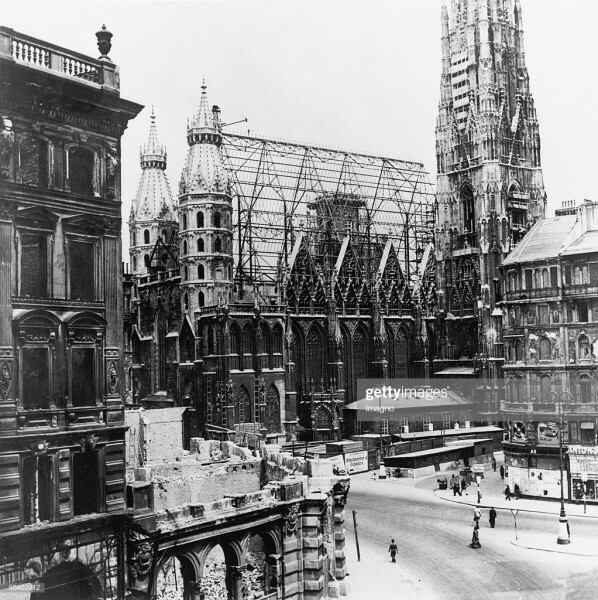 This led to major renovations in the 19th century. The main reason that it hasn't fallen into rubble is due to the popularity of a book about a fellow with bad posture.